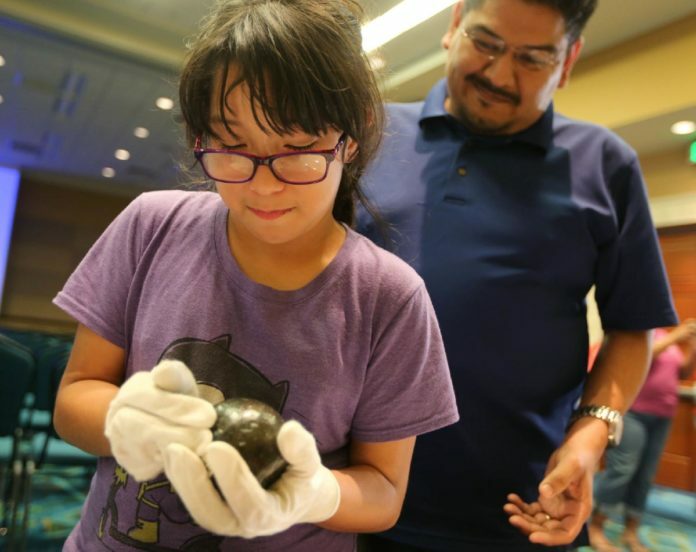 Micaela Ortiz, 9, holds a 4-and-a-half pound cannonball that was found in 1875 at the Alamo as her father, Guadalupe, stands by her Monday, April 30, 2018, at the McAllen Convention Center. The cannonball was part of The Alamo Treasure Roadshow, which is traveling the state to gain interest in a restoration project to the Alamo and grounds in San Antonio. McALLEN — Texas wants to make sure everyone remembers the Alamo. The Alamo Roadshow, organized by Alamo Complex Management and the Texas General Land Office, came to McAllen Monday as a part of its 10-city tour around the state. The show offers a glimpse into the ongoing preservation work being done at one of the state’s most famous tourist attractions. The structure was built 300 years ago, and this is the most significant renovation plan it’s seen. Beginning the presentation at the McAllen Convention Center, Bryan Preston, a Texas General Land Office representative, used a 360 image to compare the present-day Alamo site to what it looked like in 1836. About 80 percent of it is gone, and it is now surrounded by one of the largest cities in the nation. Made of limestone, the structure is vulnerable to moisture, and surrounding traffic wears down the original blocks more and more every year. Preston said the plan is projected to cost between $400-450 million, of which $106 million has been paid by the state. The rest will come from the City of San Antonio and private funding. If all goes as planned, it will be completed by 2024. Robert Trevino, a San Antonio city councilman and McAllen-native, gave a presentation on the Alamo Master Plan. The plan will cost the city about $38 million and will require them to close off a busy two-way street in their downtown and relocate some adjacent businesses. It’s a small price to pay, Treviño said. “It’s not a building; it’s a place,” Trevino said to the roughly 50-person crowd. Often, he explained, when tourists visit the Alamo they stay for less than 10 minutes. That, and the lack of historical context associated with the current location are the biggest problems on Treviño’s watch. The Alamo is best known as the site of the 1836 battle in which William Travis’ much smaller military was defeated by Mexican forces under General Santa Anna. A week later, in an unlikely victory at the Battle of San Jacinto, the Texan militia coined the phrase “Remember the Alamo” as their battle cry. Though, the way history is interpreted is subjective, and the new facility hopes to include “all the layers of history,” Treviño said, adding that if you ask a historian from the Rio Grande Valley or Mexico about the Alamo, their take would probably be much different than what is currently reflected in most literature. Slavery, among other troubling historic actualities, will find its way into the story as well.